What does it really mean to share responsibility, accountability and credit for helping all kids succeed? The work on the ground us where innovation emerges. At the sites above we provide in-kind coaching and technical support to help teams identify, measure and evaluate tangible practices to guide local community improvement and inspire countywide scaling. Successful outcomes are more effective when they are driven from the experiences of those working directly with kids and families. We are working to create a new structure in which practices at the student level shape policy and investments. 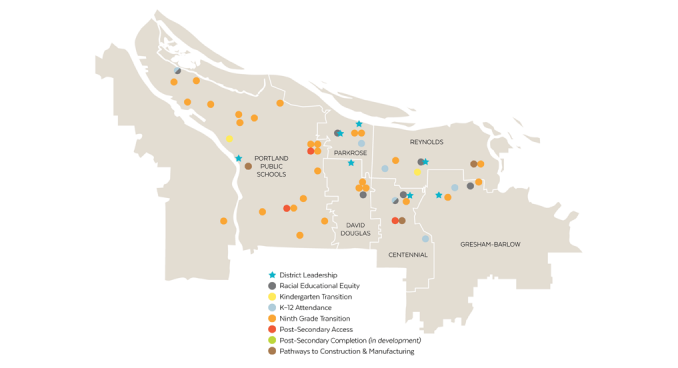 All Hands Raised is leading the community’s shared efforts to drive collaborative action across sectors to make real change in education and career outcomes countywide.